It can be all too easy to buy your holiday wardrobe in a last-minute panic (I've often been that person who buys a bikini on my lunch break mere hours before my flight). But I've learnt that in order to really feel confident on the beach, it's best to avoid that rush and buy your holiday wardrobe as soon as the best new pieces to land in-store. You might assume this is a terrible time to buy a bikini, however, with winter getaways becoming more popular and Easter holidays around the corner, this is actually a clever time to shop for beachwear. But "beachwear" is no longer just all about bikinis and one-pieces— Net-a-Porter notes that 60% of the beachwear sales on the site come from clothes rather than swimwear. To save you from a pre-flight impulse shopping spree, we turned to Lily Russo-Bah the founder of Beach Flamingo for her guide to all the key trends for 2019. Keep scrolling for what you'll see on the coolest beaches in 2019. "From Solid & Striped ribbed textured fabric to floral wallpaper prints at Clube Bossa and Rixo’s 80’s inspired swimwear shapes, there has been a shift away from skimpy Brazilian bottoms to high waisted sets that are perfect for capturing those perfect holiday snaps for Instagram," says Lily. "Leopard print is now seen more as a must-have timeless classic rather than a statement print that is of the moment, so designers have turned their attention to other species of the animal kingdom such as tiger print and cowhide," says Lily. "This trend first hit our wardrobe last summer thanks to Solid & Striped and Brit label Hunza G. Its set to stay for the foreseeable future. Once again the desire to accessorise and create more of a ‘look’ when heading to the beach has meant this is definitely one of the most popular trends—not to mention there’s nothing better than being nipped in at the waist to create the perfect poolside curves," says Lily. Shell accessories exploded on Instagram last summer, but this is continuing well into 2019 with shell jewellery and raffia bags adorned with treasures from the sea. Nothing says holiday quite like a string of puka shells. "There are few resort wear designers who haven’t created the perfect co-ord this season," says Lily. "What’s great is these matching sets can be worn both on holiday and at home in the city, and with limited packing space, you can create twice as many outfits by mixing and matching them with pieces from your existing wardrobe." 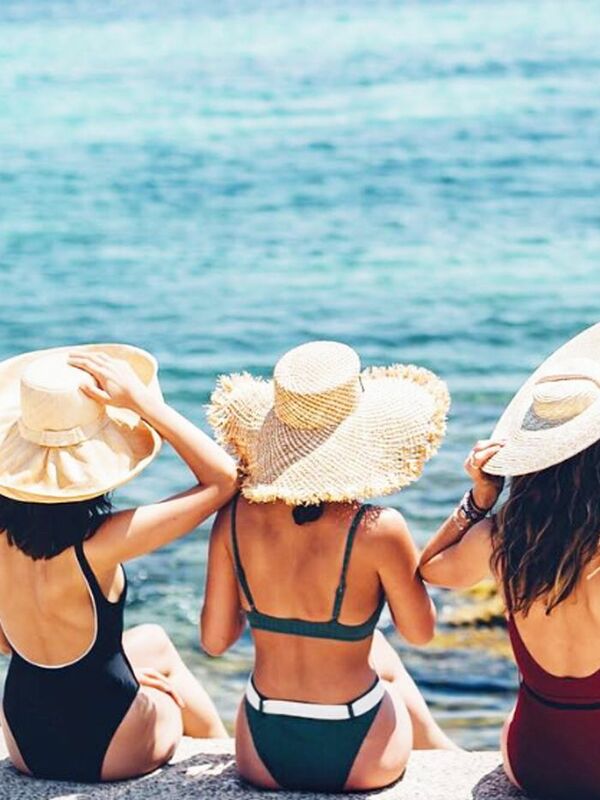 "Fashion trends always go in cycles, however, Instagram has played a big part in the swimwear trends we are seeing come through each season. High-waisted bikinis are not only super flattering but also act more like an outfit when heading to the beach. And if you’re worried about tan lines like myself, just simply roll your bikini bottoms down when you hit the sun lounger," says Lily. "Vintage inspired shapes with high necklines, peplum waists or voluminous hems; the midi dress comes in many iterations for summer 2019," adds Lily.